These popular headphones are plenty loud and bass-heavy, and will liven up any commute--unless the commuter is an audiophile. The following headphones can turn your smartphone into a powerful jukebox for livening up your commutes and workouts, so long as you don’t demand pristine audio quality. I spent a few weeks taking note of the headphones I see the most on the street, at the gym, on the bus, or on the train here in San Francisco. The ones I spotted most often go very heavy on the bass and the overall volume, and some handle the challenge better than others. The following headphones can turn your smartphone into a powerful jukebox for livening up your commutes and workouts, so long as you don't demand pristine audio quality. The Beats Studio model is the latest in the highly successful (and visible) line of Beats headphones. Somewhat bulkier than earlier Beats products, the Studio set features black leather pads, which I found to be comfortable as well as effective at blocking out ambient noise. The headband is shiny plastic with a rubber pad on the underside. The cable is detachable and features the familiar volume controller and microphone. The middle button pauses the music and turns on the small microphone for voice calls. Holding down that button activates the voice-command function on your iPhone or Android device. On the outside of the left headphone is a button that allows you to mute the sound quickly. 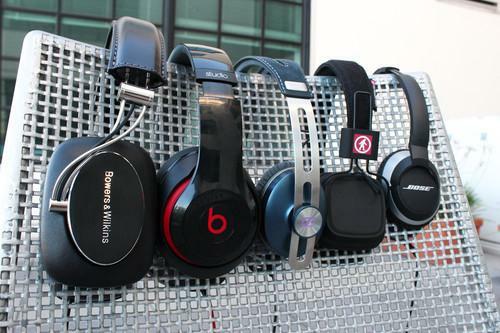 The Beats Studio headphones are easily the loudest of all the models in this roundup. That's partly because they are chargeable and self-powered (so they don't rely completely on the small amplifier in your phone), and partly because they are tuned for high-volume playback. They're a bit of a blunt instrument, but they're still good 'phones. Not surprisingly, they produce a punchy, bass-heavy reproduction of your music. On the hip-hop recordings I used for testing, the bass was massive and deep, but it did not sound blown-out or messy. It seemed to confine itself to a defined space in the frequency range. You'll find no shortage of headphones on the market today that allow the bass to blow out the rest of the mix, but the Beats Studio set isn't among them. When I listened to rock such as tunes from The Strokes and Steely Dan, I noticed that the kick drums and bass guitars in the low-mid range were punchy and well defined. The Studio headphones are less impressive in the mids and highs, as they reproduce those sounds with a decent amount of presence but fail to generate the kind of definition and clarity you hear through other headphones such as the Sennheiser Momentum set. Both the Momentum and the Beat Studio are loud, but the Beat headphones create a more in-your-face sound that I found irritating at times. They seem to be tuned to play recordings that are loud and one-dimensional--so they may be just right for the kind of stuff the music industry is pumping out these days. The problem is, you don't get a choice with these headphones. The Studio gives all recordings--even classics from 1960s and 1970s--that same loud, in-your-face sound. The Sennheiser Momentum On-Ear set is surprisingly good. As lightweight, sub-$300 headphones go, this model is now the one to beat. The first things you notice about the Momentum are the stainless-steel headband and the ear pads made of a cushiony material called Alcantara. The cable (which you cannot detach) has a metal-and-plastic volume control with the now-obligatory toggle button and remote microphone for taking phone calls. The Momentum's cans are fairly compact, but they make big sound. I tested them (and all of the headphones in this roundup) using the music player in the iPhone 4s, and with the Momentum I immediately noticed the high output level. Given the limitations of the small amplifier in an iPhone, the sound from the Momentum set seemed disproportionately large. I detected no distortion as I approached top volume level. Next I noticed the nice definition and separation of the instruments in the midrange and mid-high range of the recording. I also heard a lot of punch at those frequencies. Given what I was hearing in those ranges, I was half-cringing for fear that the extreme highs would deliver the same kind of punch and end up sounding shrill. That didn't happen: These headphones have a nice way of rolling off the treble in the extreme high part of the frequency range, creating a smoothness at the high end without underplaying those sounds. The Momentum headphones don't give you the outsized bass you hear on many of today's competitors. In my tests the representation of the bass sounded tight and well contained, and in correct proportion to the rest of the music. Part of the reason the Momentum On-Ear headphones sound so good is that they isolate a sizable air space between your ear and the driver. To seal off that space, the cans need to press tightly against your head. Sennheiser outfitted the Momentum with some nice, soft cushions to help ease that tightness, but after I wore the headphones for 45 minutes or so, fatigue began setting in. Originally I was hesitant to include the Bowers & Wilkins P7 in this review because of its large size. But the Beats Studio headphones are even bigger, and I'm seeing people wear them around town, and even at the gym. Big, bulky headphones are in. The P7 smells and feels like a big, comfy leather chair. The headband is made of cushiony brown leather and silver steel. This is a nice-looking set of headphones. I like the way the large, rounded-square cans angle slightly inward to fit tightly and comfortably over my ears. Everything about the P7--the materials, the physical design, and the audio performance--seems to be guided by a "smooth" aesthetic. Sporting large, 40-millimeter drivers inside, the P7 headphones create a powerful bass kick, but it doesn't leap out at you as with some of the other popular headphones in this roundup. You feel as if there's some room between your eardrum and that bass sound. I also like the fact that I can hear some nice separation between the sounds in the middle and high frequency ranges of the music. In one song, it sounded as if there was some space between a ride cymbal panned over toward my right ear and a guitar playing in the right rear of the mix. Recording engineers spend a lot of time creating such separation, and the P7 reproduces it fairly accurately. Comparing the P7 with my test headphone set (the Sony MDR-V6), I noted some limitations in the clarity and crispness of sounds in the higher frequency ranges. All in all, however, I found the P7 satisfying from an audio point of view. Not surprisingly, these headphones are especially good for listening to jazz and classical music. The Bose OE2 isn't the best-sounding set of headphones in this roundup, but I've used it more than any of the others. I like the compact design and the way the soft leather of the ear pads fits over my ears. The OE2 is designed so that the cones swivel to fit the exact angle of the front of your ears (everyone is different). Although the headphones are mainly plastic, they don't seem delicate; I've had no problem wearing them for workouts.The joint in the overhead arch allows them to fold inward for toting in a pocket. I like the removable cord, too. If the cord gets caught on, say, something on your bike, or a machine at the gym, or on somebody's briefcase on a crowded train, your headphones don't come flying off. The cord comes out, and your expensive headphones are saved. However, the OE2 is the only set in this roundup that does not include a volume control and phone mic on the cord. The OE2 headphones are a little less impressive in sound performance. You'll hear plenty of bass response, without any muddiness. But everything above that--namely, the mids, the high-mids, and highs--will sound a little more remote and boxy than on, for instance, the Momentum set. The sound isn't terrible, just lackluster. Weigh the appealing design, comfort, and price against those aural considerations, and you have your verdict on the OE2. Whether you'll like these headphones depends a lot on what you plan to use them for. With the Outdoor Technology Privates, you also have some trade-offs to consider. The sound profile of the Privates is pretty similar to that of the Bose OE2, with one important difference: These headphones kick out plenty of bass, but they don't contain it in a defined space nearly as well as the OE2 set does. The bass seems to bleed over the lines and spill out over other sounds in the low-mid and mid frequencies, which creates a muddy sound at the low end, especially in music that's bass-heavy to begin with. In the upper half of the frequency range, the sound isolation and definition are a little better but, as with the OE2, nothing to write home about. When I compared the Privates with my Sony test headphones, the high-frequency parts of snare and cymbal sounds sounded dull on the former. And yet, despite their aural limitations, I really like these headphones. I like their simple construction, even including the wire things that connect the cans to the headband. And yes, I'll admit, I like the little red and white Bigfoot logo. These are the only headphones in this roundup that connect to a phone wirelessly via Bluetooth. In my experience using the Privates at the gym and on my bike, they connect easily and hold the connection. Some cool design innovations are worth mentioning, as well. One of the cans contains a small microphone for taking calls while connected to your phone via Bluetooth. To turn the volume up and down, you swipe your finger up and down on the outside panel of the right headphone. You swipe forward or backward to move between songs in your playlists. These cans are worth the hundred bucks right now. They'd be worth even more if they just sounded a little better. Out of all the headphones I tried, the Momentum set from Sennheiser offered the best mix of tasteful design, comfort, and good audio quality. Although they do not create the massive blob of bass that some listeners may prefer, they do pump out a lot of volume. Most important, their sound is crisp and well defined in all frequency ranges. I found things to like in all of the headphones in this mix, however. And because they cover a wide price range, the overall value of these headphones can be an important factor when you're weighing their pros and cons.